(Admission Office – Van Lang, 14/12/2018) – Morning 12th December 2018, 7 members in the Competitive Block 23 commenced first activities in the plan year 2018 -2019: visited Center for Elaboration Competency and Innovation in Clinical Simulation (CECICS) at University of Medicine Pham Ngoc Thach. After the signing agreement of mutual emulation year 2018 -2019 ceremony, Competitive Block 23 on 18th October 2018, 7 universities agreed on the series of activities on special subjects based on each member’s advantages. 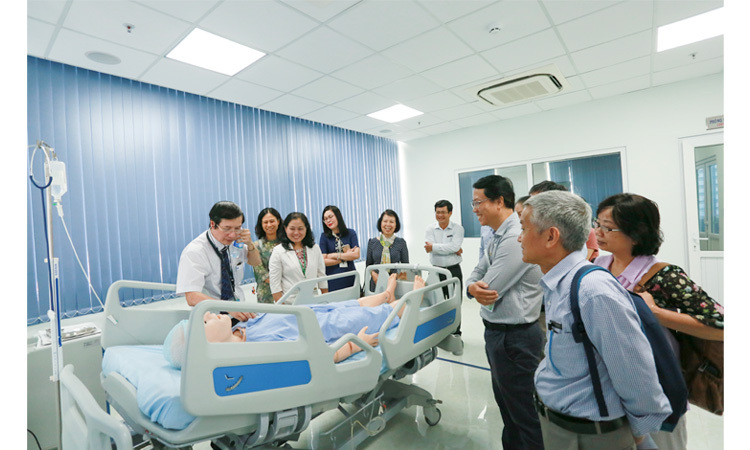 Thus, University of Medicine Pham Ngoc Thanh organized a tour and exchanged experience of constructing Center for Elaboration Competency and Innovation in Clinical Simulation (CECICS). Lecturer of Lotus University, Foreign Language-Computing Ho Chi Minh University, Technology Ho Chi Minh University, Nguyen Tat Thanh University, Van Lang University were warm welcomed by Board of Management CECICS Center, University of Medicine Pham Ngoc Thach. Representatives from Van Lang University: Dr. Nguyen Cuu Dinh – Head of Education, Dr. Ly Thi Phuong Hoa – Deputy Head of Medicine and Pharmacy Department, lecturers, officers, and department of General Administration’s officer. 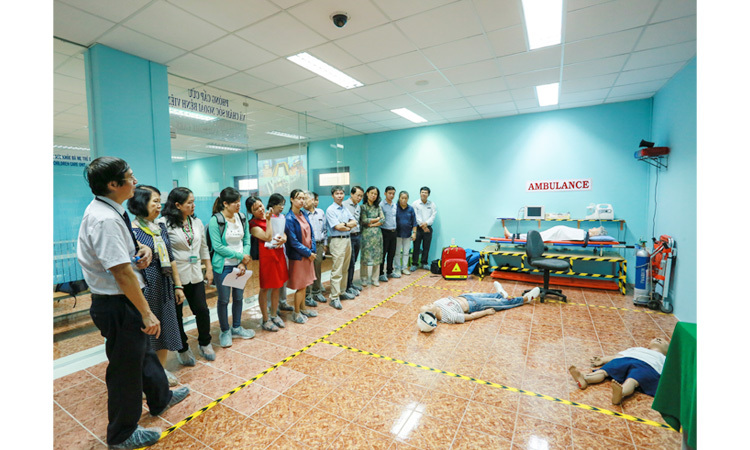 CECICS center supported Pham Ngoc Thach University in start training model on the basis of ability standard for medical doctors and postgraduate students. CECICS collaborated with Offices, departments and both domestic and international Education and Health organizations to conduct research on medical education specialized in clinical stimulation. Center is expected to be one of the most modern clinical stimulation hospital in Southeast Asia. Learning and exchanging experience from Pham Ngoc Thach University which is essential for Van Lang University that has just started training program in health industry. The department of Medicine and Pharmacy launched in 2018, and had 03 undergraduate programs: Pharmacy, Nursery, and Medical Testing Technique. There are about 50 international standard CECICS in the world, most located in developed countries such as USA, UK, Australia, and Netherland, etc. 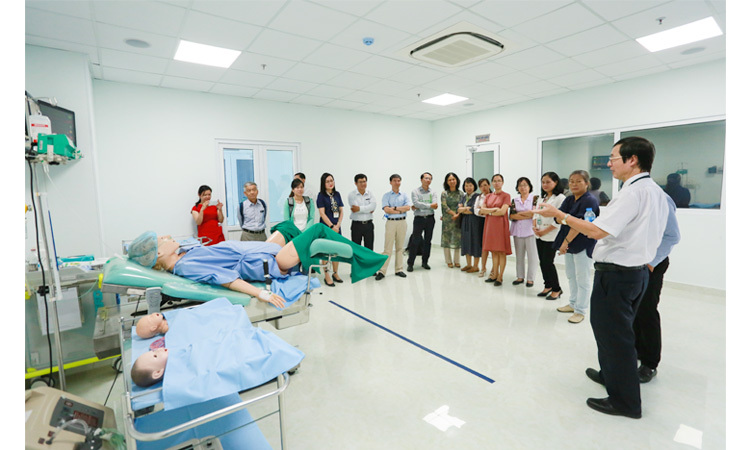 In Vietnam, most flagship universities having medicine & pharmacy training program already established their unit/department that trained skill-lab and some others built the Clinical Stimulation Centre. However, the universities encountered mutual challenges such as shortage of specialists and qualified teaching officers, infrastructure, stimulation model and synchronized devices, methods, the process of operating and managing center, etc. Despite universities’ expectation and their initial investment, the probability of effectively run Clinical Stimulation Center at international standard was still a crucial challenge. Associate Prof. Dr. Cao Van Thinh, Director of CECICS, presented to his colleagues the CECICS‘s code of standard following Society for Stimulation Healthcare’s (SSH) criteria. This managing process and program security at CECICS are seriously implied to lecturers, students and standardized patients. Guests were invited to visit the stimulation laboratories system, OSCE evaluation zone and self-learning rooms in CECICS center. 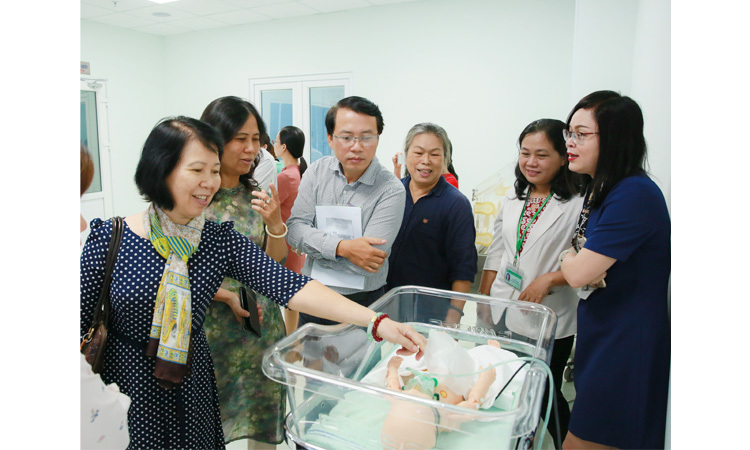 The facilities from Center improved the effectiveness of learning and research of students studying medicine, nursing, midwifery, Medical technology and graduated students of University of Medicine Pham Ngoc Thach. Stimulation educating method was effectively implemented into some training programs at Van Lang University for years: Hospitality management, Travel & Tourism Management, Accounting, Banking and Finance, and public Relation. For Medical and Pharmaceutical training, stimulation teaching technique required a higher standard of infrastructure, modern equipment, and advanced skill human resources,… After 13 years of implementing and developing stimulation teaching technique Pham Ngoc Thach University shared their valuable experience for managing board, Medicine and Pharmacy facilitators of teaching continued to develop program and educating methods, practical environment for students to aim for a higher standard of quality.